All body treatments can be added on to any massage or facial service, or can be a standalone service and are only available at Conshohocken. This body treatment starts with a cocoa and ground coffee body scrub, followed up with a cocoa butter body mud wrap. The treatment concludes with a super moisturizing and skin loving cocoa & shea butter hand whipped body butter. *Excellent accompaniment to Spray Tanning service. 45 minutes. Polish and energize the skin with antioxidants from raspberry and marionberry which brighten skin and provide anti-inflammatory benefits to soothe skin irritations. Sweet Almond Oil deeply hydrates and soothes skin while leaving a soft almond scent to the skin. *Excellent accompaniment to Spray Tanning service. 45 minutes. 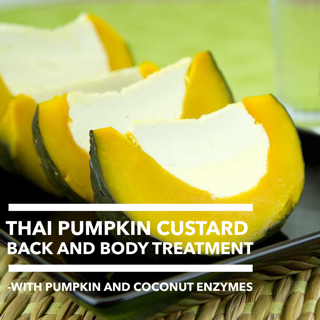 This decadent and purifying back and body treatment will leave skin glowing as coconut and pumpkin enzymes thoroughly exfoliate and hydrate, removing dead skin cells to reveal soft, healthy, radiant skin. *Excellent accompaniment to Spray Tanning service. 45 minutes.